Attached map is for use with the traditional permanent course. 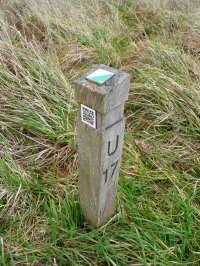 The control posts also have QR (Quick Recognition) codes, which used together with a downloadable app on a smartphone, can produce timings and course results which you can upload later. For more information, see the iOrienteering website. The original iOrienteering app is gradually being replaced by the Sporteering app, which is now the recommended app to use with the course. Walking, running, cycling, canoeing, nature conservation. Weekly Parkrun. The basic map is attached. The map for the QR code course has more information on it than the basic map. It's downloadable at Friends of Longrun Meadow website, under the Orienteering section.